It’s hard to believe summer is almost over, students are heading back to school, and parents everywhere are wondering where the time went. It’s easy to get caught up in the back-to-school chaos and find yourself feeling a little bittersweet about summer’s end. You can beat the back-to-school blues by making this time of change a positive experience for your whole family. Make time for exercising, preferably as a family. As everyone settles into the new school routine, you may meet some resistance from your kids. You may even find yourself rueing the early morning madness or dreading the late afternoon homework sessions. Keeping yourself and your family feeling positive about these changes is key. Take an evening walk or bike ride. Plan a weekend hiking trip or family gym time. 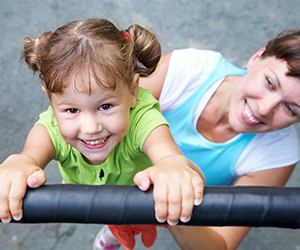 Set 2-3 fall fitness goals for each family member and encourage each other as you work towards these goals. Spend time outdoors. Since classroom time means more time indoors, make a point to spend 20-30 minutes every day outside (bonus: you’ll get your daily vitamin D, an essential vitamin which strengthens immunity among other benefits). Take your dinner out on the patio and don’t forget the sunscreen! Tend a garden. Little ones love watching things grow, so tap into their curiosity and plant a late summer garden. Check your local nursery and ask about seasonal plants that are easy to tend and will harvest in the fall. Start planning a winter getaway. Now’s the time to start pricing out your winter-break jetsetting. Whether it’s the beach or the mountains, a quick vacation during the winter months is a great way to bust out of a routine. And planning it now gives you something to look forward to as you settle into the new school year. Start a new tradition. Make back-to-school a time to celebrate by starting an annual tradition. Whether it’s a back-to-school backyard sleepover the first weekend of the school year, or back-to-school buffet night where anything goes, make it something unique and exciting. Get the whole family involved in brainstorming and sharing what they’d like to do once a year!